The last Targaryen princess, Daenerys is the daughter of the Mad King, Aerys II, who was born on Dragonstone after his death. Born during a storm, she was known as Daenerys Stormborn afterwards. Spirited away by loyal men with her brother, Viserys, in the years since the fall of House Targaryen they have fallen into a mean life, constantly moving for fear of the Usurper’s assassins while Viserys seeks some means to win back the Iron Throne. 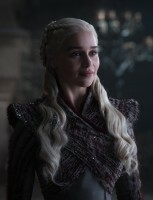 She is a very young woman, very beautiful in the inhuman way of the Valyrians, with silver-gold hair and purple eyes, and she has never known anything else than her brother’s domineering ways and obsession with the Seven Kingdoms. Daenerys has been aged for the show. In the novels, she is 13 when she is first introduced. In Game of Thrones, she is 15 years old. Contacts to give her violet eyes were tried in the pilot, but proved more trouble than they were worth.